An ornate 17th century cabinet with the most aristocratic of lineages inlaid with pietre dure (hard stones) and festooned with gilded figurines has gone on display at the The J. Paul Getty Museum in Los Angeles. The Getty bought the cabinet at a Sotheby’s auction in Paris last fall for €2.5 million ($2,790,000), a record price for a piece of Roman furniture, and they had no qualms about spending it given its exceptional quality and previous owners. 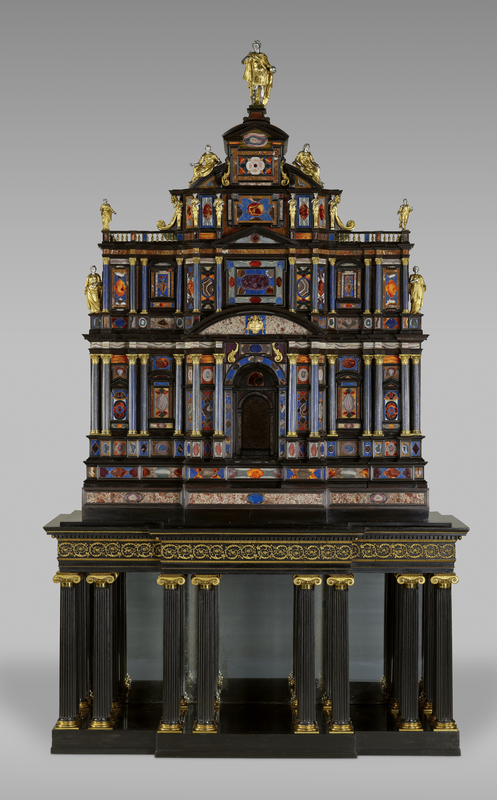 The cabinet was produced around 1620 by an unknown maker in Rome. 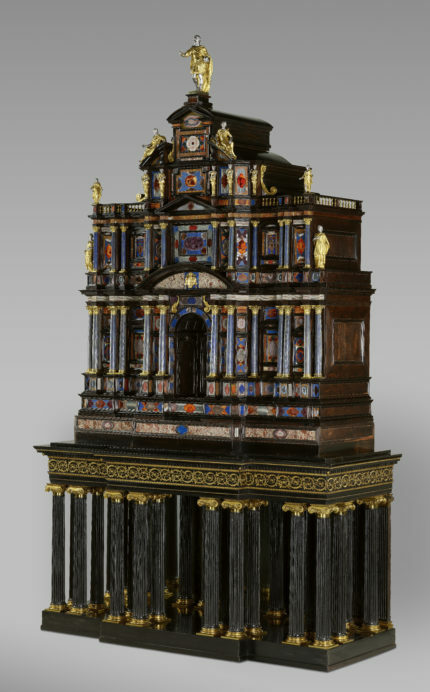 Made of ebony, fir, chestnut, rosewood and walnut wood, the display cabinet is around six feet tall and was designed to look like a three-tiered Baroque church facade, only in a riot of vibrant colors from finely carved inlaid hard stones, including lapis lazuli, jasper, agate, carnelian and amethyst. Only the hardest, most expensive, most difficult to work stones were used in this piece, an unmistakable message to those in the know that this was a unique, top-of-the-line luxury object that only the greatest of the great could afford. The first level of the facade is decorated with four pairs of Corinthian columns and a set of three on either side of a nice made to look like a doorway. It’s topped with a semi-circular pediment containing the gilded coat of arms of Pope Paul V, born Camillo Borghese. More Corinthian columns, slightly smaller in scale, adorn the second level which has a triangular pediment in the middle. Two gilded female allegories flank the level. The third level is a balustrade with allegories on each end and six caryatids holding up a semi-circular pediment. Silver gilt allegories recline atop the pediment while a Roman emperor stands at the apex of the roof. Paul V commissioned this masterpiece as an elaborate display cabinet meant to hold the family’s treasures squirreled away in its many drawers and hidden compartments. 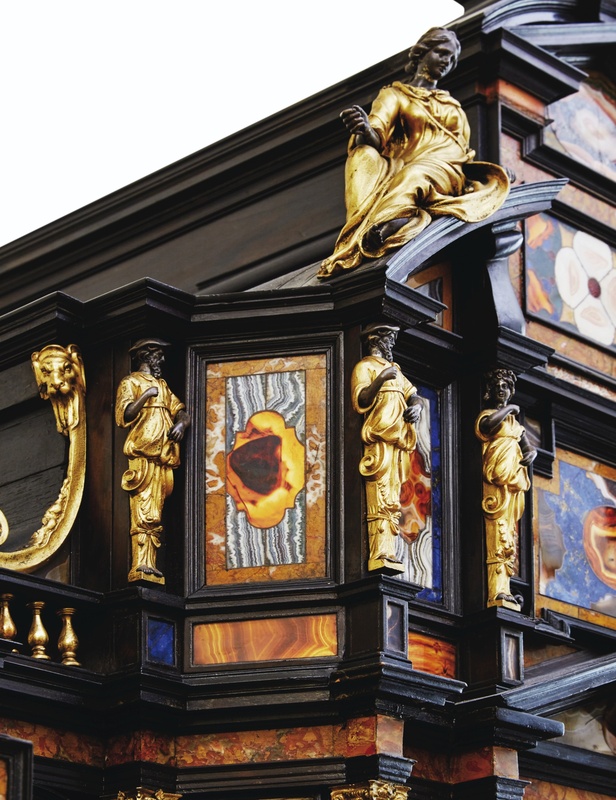 Inlaid pietre dure cabinets were de rigeur in the palaces of the crowned heads of Europe in the 17th century, fitting settings for collections of even more precious objects, jewels and heirlooms. It remained in the Borghese family until the early 1820s when it was bought from Prince Camillo Borghese by an English art dealer, possibly W. Kent. The Neoclassical veneered ebony stand was already attached to the cabinet by that time because an 1821 Christie’s catalogue entry mentions it. It was made by French cabinet maker Alexandre Louis Bellangé who mirrored the shape and columns of the cabinet and added gilt bronze capitals and scrollwork to match its gilded elements. The cabinet didn’t sell at that 1821 auction. The next known owner is London art dealer Edward Holmes Baldock who acquired it around 1827 and flipped it right quick. That same year, he sold it to King George IV whereupon the Borghese Cabinet entered the Royal Collection. 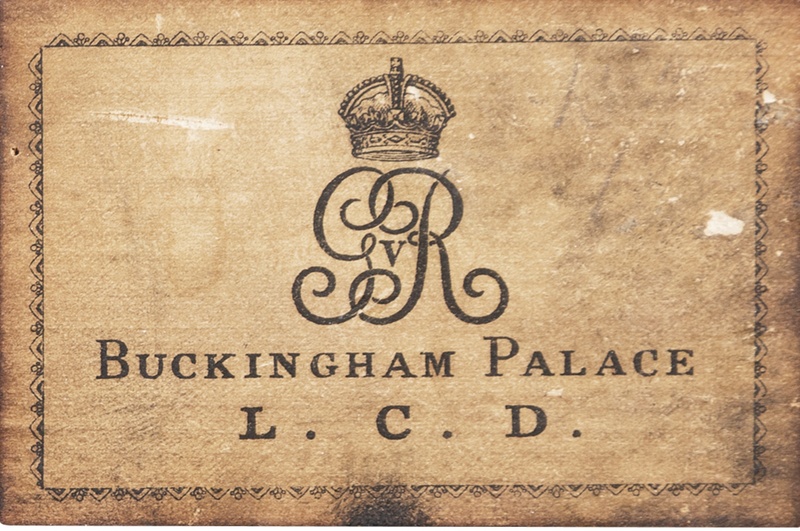 Three labels on the back indicate the cabinet’s new home was Buckingham Palace, at one point the Green Drawing Room. The royal cypher of King George V is on one of the labels. The British royal family kept the cabinet until 1959 when it was sold by order of Queen Elizabeth II in an auction of objects from the Royal Collection. The buyer was Aladar de Zellinger Balkany, a businessman of Hungarian extraction. 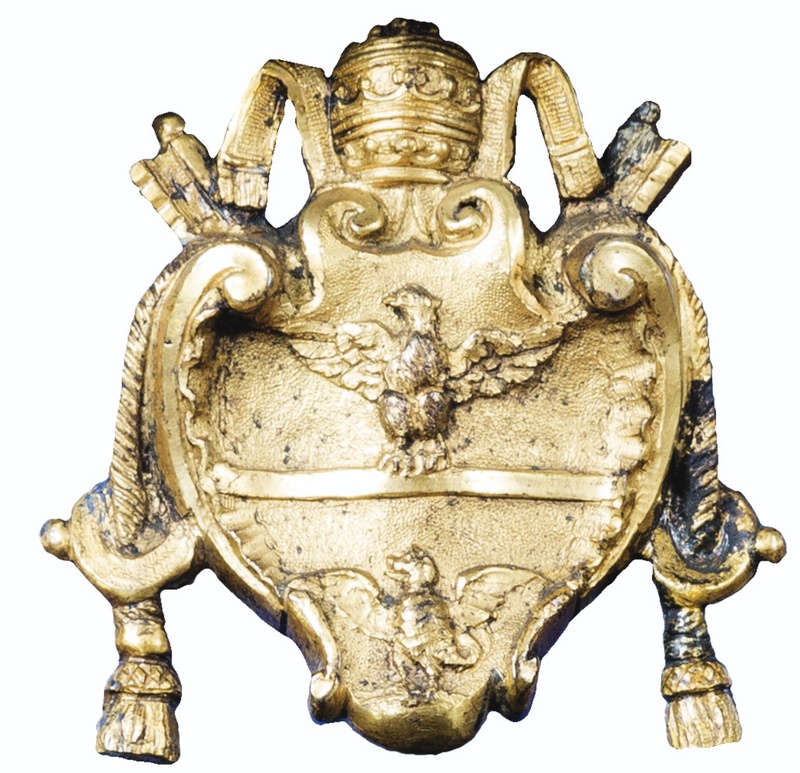 He left it to his son Robert de Balkany, a real estate developer who was even more an avid collector of objets d’art than his father. It decorated his palace, the Hôtel Feuquières, on the rue de Varenne in Paris until his death in 2015. The cabinet was auctioned off in 2016 in Sotheby’s Paris’ sale of the Robert de Balkany collection. This entry was posted on Monday, June 19th, 2017 at 11:35 PM	and is filed under Modern(ish), Museums. You can follow any responses to this entry through the RSS 2.0 feed. You can skip to the end and leave a response. Pinging is currently not allowed. It’s a bit much, with all those different stones so close together. But I suppose that’s the point. I’d love to poke around the interior, looking for secret hiding places! Nothing succeeds like excess! 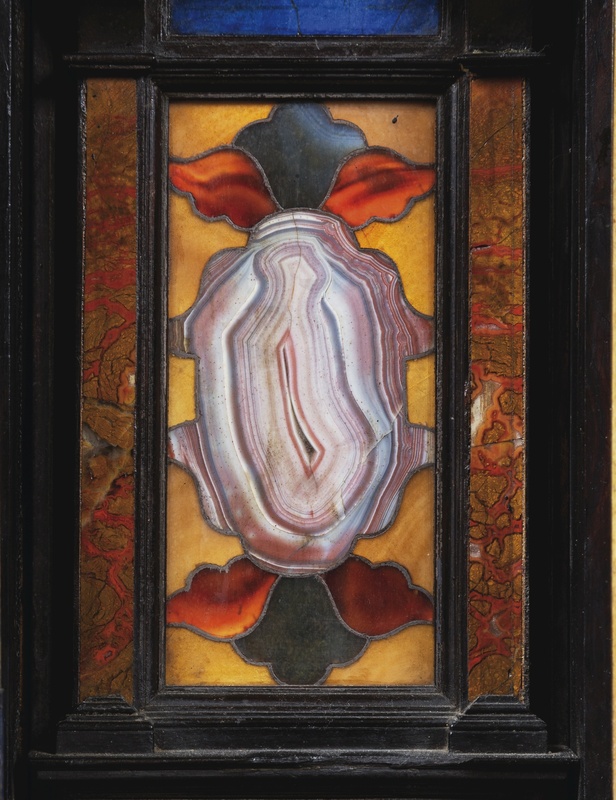 The aggressively patterned stones in strong colors is one of the things that dates this work in pietre dure to quite early in the seventeenth century–and identifies it as Roman, not Florentine. In any case, it’s a brilliant acquisition for the Getty at a very reasonable price, especially when you consider how little Koons or Basquiat you can get for $2,790,000 these days. I wonder how much it sold for in 1959, in the auction of objects from the Royal Collection? Yet another compelling reminder of the dangers of deaccessioning. Curiously enough, the Curator of the Royal Collections in 1959 was Anthony Blunt–Soviet spy and noted specialist in the Baroque, wit a love for exactly that sort of thing. rut-roh, There may be a problem with the site, can’t view the photos, Chrome “runs out of memory while loading.” Hope it’s just my server, and not the upgrade. For ‘hardstone afficionados’, I recommend a trip to Valetta’s St. John’s Co-Cathedral: A ‘pietre dure’ floor with tomb slabs of the knights. The whole thing, particularly its interior, truly is a gem. PS: Emily, it might be a rather wild guess, but if “Chrome runs out of memory”, there might be “not enough memory” for Chrome (i.e. RAM). Consider to restart the Browser and see what RAM in consumed. I’m not keen on so much irreplaceable art being stored on the Pacific “ring of fire”. Couldn’t it all be moved to Chicago or the like? It might be that Chrome doesn’t like the size of the image as it’s 6971 × 11212 pixels in size, perhaps try another browser? Yeah, the images are enormous and stuff in that range tends to make some browsers sad. They can be saved and viewed locally painlessly enough on most computers, though. Amazing, but the French base of columns that was added on (I did get that correct?) doesn’t seem to go very well in my humble opinion. The load of the first and full length photo was slow on Firefox, but it did load. I hope to see it in person some day at the Getty. Didn’t really have a reason to go back, but I do now. Thank you for continuing to cover news items such as the Borghese cabinet. It is difficult to find information on these topics and most blogs don’t devote attention to objects of furniture or what some might call decorative art. That said, thank you for appreciating beautiful and historically important artifacts (great and small) and for sharing them with us. The stories of these objects are just as significant as more blockbuster items such as monumental Egyptian statues.